Downloading a film and sharing or streaming content is about to become faster and more reliable for more than 30,000 homes and businesses in Hamilton. People living in the South Lanarkshire town are set to benefit from access to some of the fastest broadband speeds available (up to 330 Mbps), providing enough bandwidth for a family of four to all stream ultra HD or 4k quality movies or TV simultaneously. It’s after Openreach, the UK’s largest telephone and broadband network, announced the next 81 locations to be upgraded under their ultrafast broadband investment. As well as adding even more reliability and resilience to the network - meaning the connection is less likely to drop out - ultrafast broadband brings faster speeds and greater capacity for multiple devices and applications like on-demand video, Virtual Reality gaming and smart home technology. Andrew Hepburn, Openreach’s director of major programmes in Scotland, said: “We’re delighted to be upgrading our network and extending our ultrafast broadband reach to new locations in Scotland, benefitting thousands more homes and businesses. The amount people are doing online is growing every year and the pace shows no sign of slowing. We understand people need to have a fast and reliable connection at home and at work, and our ultrafast broadband network is at the forefront of making that happen. Openreach has made ultrafast broadband – using a mix of technologies - available to more than two million premises across the UK, and has ambitions to go even further. This latest work in Hamilton will use a technology called Gfast, which builds on existing infrastructure, changing the way broadband signals are transmitted to make them ultrafast without the need to dig up roads and install new cabling all the way to the property. 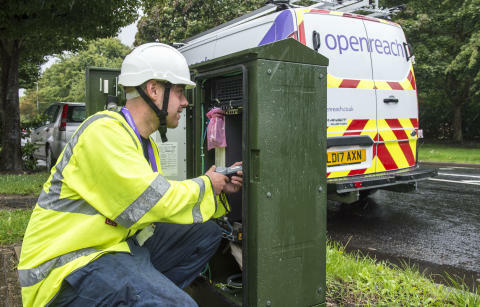 The rollout will see Openreach engineers building on the existing high speed broadband network across South Lanarkshire, where nearly 96 per cent of homes and businesses already have access to superfast (speeds of 24Mbps and above) broadband. With superfast broadband, things like uploading and downloading music, films and photos all happen quickly and it’s great for studying or working from home. Across Scotland, more than 3,100 people are employed by Openreach, most of them engineers. It was announced earlier this year that 400 new engineers are being recruited throughout the country to help with the ultrafast broadband rollout. Acomb, Addiscombe, Aintree, Ascot, Bargoed (Cardiff), Barking, Barnsley, Beckenham, Beulah Hill (Croydon), Blackpool, Bootle, Bradford, Broadwell, Canonbury, Chingford, Colchester, Colindale, Dalton in Furness, Daubhill, Deal, Dover, Downloand (Croydon), Earley, Eastbourne, Eastleigh, Enfield, Faversham, Felixstowe, Feltham, Forest Hill, Godalming, Greenwich, Hamilton, Harlesden, Hatch End, Healing, Hendon, Hitchin, Hyde, Kemptown, Kentish Town, Kenton, Leicester Central, Leytonstone, Lincoln, Littlehampton, Llanrumney, Lords, Lower Holloway, Malden, Midland (Birmingham), Mill Hill, Moss Side, North Wembley, Northampton, Oldham, Pendleton, Plympton, Ponders End, Prescot, Primrose Hill, Purfleet, Rainham, Rock Ferry, Rushey Green, Staylbridge, Stamford, Stoke City, Sydenham (Croydon), Teddington, Tewkesbury, Tranent (East Lothian), Upper Holloway, Urmston (South Manchester), Wallington, Waterloo, Wembley, West Kensington, West Wickham, Willesden, Worthing Central. Gfast technology builds on our existing infrastructure and changes the way we transmit broadband signals to make them ultrafast without the need to install new cabling all the way to a property. Gfast works by running a fibre from the telephone exchange to the fibre street cabinet – a side pod is bolted to the street cabinet and new electronics provides a more powerful signal that then travels over existing copper lines into the home or business. Once the side pod’s attached and connected, we’re ready to take orders from communications providers. Our online fibre checker is updated so that people can see if they can get a Gfast service. The information also appears on the systems our communications providers use to order service. Using Gfast we can make ultrafast fibre available more quickly to a much larger number of homes and businesses than if it focused on ‘Full Fibre’ (FTTP) technology alone. Gfast ultrafast speeds let you download a two hour HD film in just 90 seconds, a 45 minute HD TV show in just 16 seconds, or a nine hour audio book in just three seconds. Openreach is stocking up on thousands of snow shoes, salt and screenwash to make sure millions of people stay connected in the event of severe weather this winter. Lessons learned from dealing with extreme weather over the last few winters has seen the UK’s digital network business invest in record amounts of stock this year to keep its engineers on the road.